Sign up to win January's free give-away! I am this month's Common Thread Give-Away Artist of the Month. Our Common Thread Group is made up of various artists who have become friends and support each other by encouraging our followers to visit each other's web-sites. The first Monday of the month we remind our readers to sign up to win a free sample of an artist's work. This gives our readers a chance to get to know other artists, as well as a chance to win a piece of their work completely free! It is our way of thanking you all for following our blogs and work. 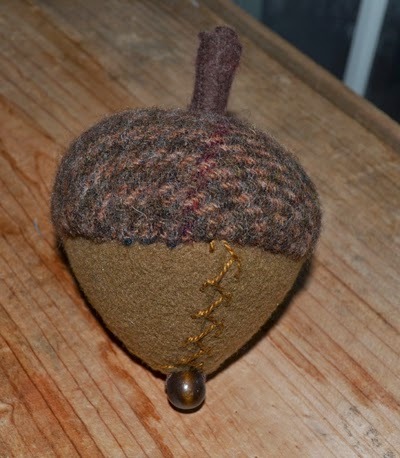 This month I will be giving away one of my new wool sculptures, a small wool acorn, that can be used as a pincushion or simply decor for your house. It measures about four and a half inches in length from tip of stem to bottom of bead and is about three inches across. It is made from three different felted wools and is stuffed with polyfil. It is embellished with feather stitching done by hand with pearl cotton and a brown wooden bead. All you need to do to register, is to leave a comment from Monday through Wednesday on my website and the winner will be drawn at the end of the week and posted. Acorns, I learned, are the seed of the mighty oak tree, which is sacred in many cultures as it symbolizes strength, power, unlimited potential and spiritual growth. Thus they are an emblem of luck, prosperity, youthfulness and power. They also represent security and abundance and are symbols of fertility. They have been used as a talisman against lightening if kept in a windowsill (though it is not a good idea to place anything made of wool in sunlight as it will cause it to fade). This is the reason that many window shade blind pulls are made in the shape of an acorn. Acorns are also thought to counteract loneliness, illness, pain, preserve youthfulness and aid in longevity, and bring luck. To plant an acorn by the light of the moon is to bring good luck and prosperity to you. Soaking acorn caps makes for a natural black dye. Soaking and grinding acorn nuts make a rich flour for baking nutritious cakes that not only have culinary properties but medicinal qualities as well. There are many fun and interesting mythological stories involving acorns that can be found on line. I think it is fitting that a New Year's give-away gift be one of my wool acorns. Hopefully it will bring you, your family and house, all that it symbolizes!! Leave a comment below to win this acorn for yourself or a friend and please visit the web-sites of all of our Common Thread Artists, by simply clicking on their websites listed on the left as A Few of My Favorite Places. You can also see what is in my Etsy Stop by clicking on LittleHouseHomeArts under Etsy at the top left. Thank you again for following all of us. We appreciate your support and interest in our work and whether or not you win this acorn, we wish you all a healthy and prosperous New Year!! *I have other acorn pincushions, if you are interested in purchasing one, just leave me a comment and I will be glad to send you pictures. They are not yet listed in my Etsy Shop. Labels: Free monthly give-away drawing, soft sculptured acorn; pincushion; home decoration. Acorn symbolism. New Year's gift. Common Thread Artists Group.